$4.335 million on 1126 screens. Acclaimed … and now mainstream - burnout Hunter S. Thompson wrote the epitaph for the drug generation with his semi-journalistic narrative of panic, drugs, and despair in his 1971 book, “Fear and Loathing in Las Vegas”. Terry Gilliam – probably the best man for the job when it came to bringing this book to the big screen – took on the task on translating this hallucinogen-induced mess into a major motion picture and surprisingly enough, succeeded (somewhat) where many before him had failed. Gilliam falls into a small category of filmmakers who are able to make alluring, semi-demented films that delight his core group of fans and simply confuse everybody else. However, he manages to bring Fear and Loathing to life though some mildly coherent scenes that remind us all that no matter how bad things are, it’s occasionally quite funny to watch people who are extremely high on drugs. While the story is hard to follow at times for those of us who have spent the majority of our lives drug-free and placidly coherent, Fear and Loathing in Las Vegas remains only mildly entertaining in spots, but far from a cornerstone of American cinema. Remember that when the book was written, the drug culture was still quite rampant in this country and a whole series of films were launched to extol the sometimes-hilarious virtues of drugs – mainly marijuana. (Cheech and Chong anyone?) Drugs were cool; drugs expanded your mind – they didn’t fry it; and casual use was chic and was something that was applauded for its inherent rebelliousness. However, things changed in the late 1980’s and drug humor all but disappeared from popular culture. While it seemed to make a comeback in recent years, it’s nothing like it used to be and it’s quite amazing that the film made it to the big screen as unscathed as it did. Such as it is though, Fear and Loathing in Las Vegas is one long, drawn-out, occasionally coherent mess that really has no fluid storyline whatsoever – but there never was one to begin with. As previously mentioned, the film and its screenplay comes from inventive filmmaker and former Monty Python’er Terry Gilliam. As evidenced by his previous outings of Brazil and 12 Monkeys, he has plenty of experience in films that deal with delusion, psychosis, madness, and altered-states. The film at hand stars a maniacal Johnny Depp as Hunter S. Thompson’s alter-ego, - gonzo journalist Raoul Duke - and a beefed-up and slightly overweight Benicio Del Toro as Dr. Gonzo, Thompson’s “attorney” and beloved drug-abusing friend. We meet the duo as they are on the road to the sin city of Las Vegas with a trunk full of “uppers, downers, screamers, and laughers” so Thompson can cover an off-road race for Sports Illustrated – which, for the most part, he manages to miss. However, he and Gonzo manage to fit in a lot of drugs along the way, pick up a hitchhiker, do some drugs, hit a circus themed casino, do some drugs, trash a hotel room, do some drugs, attend a drug enforcement convention, do some drugs, and then trash another hotel room … by the way, did I mention the drugs? After re-watching the film recently after a 4-5 year hiatus, it’s become painfully obvious that Fear and Loathing isn’t as much fun as I originally recall. Maybe it’s because I’m older – and theoretically wiser – or I’m becoming more like my parents. Whatever the case, iin all honesty, Fear and Loathing in Las Vegas is a one-trick pony that gets rather tiresome as the film rolls on. I feel that my film tastes have become quite refined over the years and I enjoy less and less cookie cutter crap than I did even 2-3 years ago. However, there are some films that I feel like I’m supposed to enjoy that I simply don’t - 2001 is one, so is Clockwork Orange, and now, add Fear and Loathing to that list. I don’t really understand what I’m supposed to glean from a movie where the principal(s) get extremely high and see lizard heads in place of Las Vegas gambler’s “normal” heads, trash hotel rooms and berate employees, puke and mumble incoherently into toilets, and on and on it goes. It’s not so much that I have problems with drinking and drugs so much as I do with the fact that the film displays it in such abject excess that it becomes rather laborious to watch. If I hung out with this duo, I’d have left a lot sooner than the 119 minutes it took the film to end. I don’t doubt the social relevance of Thompson’s ramblings – and I’ll be the first to point out his (at times) frenzied brilliance. He lived in a different time and a different place – and it was a time where the United States turned a blind-eye to substance abuse and many used these drugs as an escape from the many drastic societal changes that were taking place during the turbulent period. However, if the film had a sense of working towards something - a tidy ending or telling some sort of engaging story - it would have fared much better in my eyes. Watching a couple of fumbling, bumbling, and extremely high guys goof around for a few days in Vegas gets a little old. I could watch Dude, Where’s My Car and get the same reaction. While there’s an effort made to put the drug-induced folly into some sort of societal context, it still just comes across as simple overkill in my book. That’s not to say that there aren’t memorable moments in the film – there are – it’s just that taken as a whole, the film didn’t speak to me as it does to many others of you out there. That being said, Depp and Del Toro give some fairly solid performances that become more amazing the more you watch them. Depp and Hunter S. Thompson formed a bond before, during, and after the making of the film and Depp’s uncanny portrayal of Thompson is rooted in a deep understanding of the gonzo journalist via an intimate, personal relationship with him. Depp absolutely nails him. There’s also a lot of physical humor involved in the character and Depp is able to pull it off flawlessly, although at times, it seems a bit over-the-top and too caricatured. Del Toro throws himself into his role of Dr. Gonzo by simply being completely insane and out-of-control – and it works well for what’s required of him. Fear and Loathing is also peppered with quite a few hip cameos that include Tobey Maguire, Gary Busey, Cameron Diaz, Lyle Lovett, Flea (from the Red Hot Chili Peppers), Christina Ricci, Penn Jillette, Harry Dean Stanton, Mark Harmon, and Ellen Barkin. There’s no denying that Fear and Loathing is a wild, unhinged, and at times, entertaining ride. Whether you love it or hate it, you’ve surely got a strong opinion about it and if you’ve never seen it, you owe it to yourself to check it out. 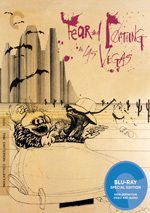 Fear and Loathing in Las Vegas appears in an aspect ratio of approximately 2.35:1 on this Blu-Ray Disc. Though not without some flat spots, the image usually looked very good. For the most part, sharpness seemed solid. Occasional soft shots emerged, particularly in the early moments, but those weren’t frequent or substantial. Instead, the film usually exhibited positive definition. I noticed no signs of shimmering or jaggies, and edge enhancement remained absent. Except for the occasional use of archival footage, the movie also lacked any print flaws. With its trippy vibe and neon Vegas setting, the film’s colors usually looked vibrant and dynamic. A few shots seemed a little murky, but most of the shots appeared lively and full. Blacks were dark and tight, and I thought shadows demonstrated nice clarity. This was a positive presentation worth a “B+”. What with all the movie’s hallucinations and hijinks, I expected an involving DTS-HD MA 5.1 soundtrack. However, the mix tended to be a bit subdued. The front spectrum dominated and showed pretty good stereo for the many pop/rock songs that pervaded the film. Effects also added some breadth, and these expanded to the surrounds to a moderate degree. But not with much consistency or liveliness. Even when the movie went all trippy, the track seemed fairly laid-back. We did get decent movement and interaction, but not to the level that would make sense for such a whacked-out flick; the soundscape remained rather ordinary. Audio quality was also nothing great. Speech was usually fairly natural, though the mix made it tough to understand lines at times. I suspect this was intentional to match the movie’s crazed feel, but it still became an occasional issue; I needed to turn on the subtitles to understand much of what was spoken. Music seemed fine, as the various songs showed decent to good reproduction; these were up and down due to the nature of the source recordings, but they were generally positive. Effects appeared acceptable but not better than that. The track lacked a lot of oomph, so the effects tended to be somewhat thin. Though I didn’t think this was a bad track, it was rather ordinary. Virtually all the extras from the original DVD release reappear here. This means we get three separate audio commentaries, the first of which comes from director Terry Gilliam. 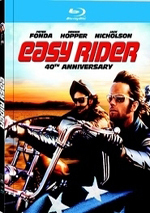 He provides a running, screen-specific look at the source book and its adaptation, music, sets and locations, cast, characters and performances, cinematography and visual design, costumes, development and working with the studio, interactions with Hunter Thompson, and other production notes. While some Gilliam commentaries are better than others, all are at least good, and many are great. This one may not match up with Gilliam's very best, but it's close to that level, as he offers an excellent evaluation of the film. Funny, frank and fascinating, Gilliam covers all the bases. For the second commentary, we hear from producer Laila Nabulsi and actors Johnny Depp and Benicio Del Toro. Each provides separate, screen-specific thoughts that get edited to create this track. They cover the project's development and working with Gilliam, cast, characters and performances, sets and locations, script/story/adaptation issues, interactions with Thompson, and anecdotes from the production. While not as rollicking as Gilliam’s commentary, this one proves to be eminently satisfying as well. Its creators meld the three participants well and form the recordings into a tight package. They provide plenty of solid info about the film and do so in an interesting fashion. Finally, we locate a commentary from author Hunter S. Thompson. He offers a running, semi-screen-specific piece in which Nabulsi acts as interviewer; Thompson’s assistant (and later wife) Anita Bejmuk and Criterion’s Michael Wiese lurk in the background, and author Douglas Brinkley briefly pops up via phone to ask Thompson a few questions. (Thompson attempts phone calls to Depp and others but these go nowhere.) 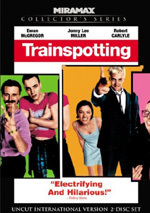 The track covers Thompson’s thoughts about the movie and the events that inspired it. He also ponders aspects of the Sixties, the drug culture, and other elements of the era and those who stood out in it; in particular, Thompson lights into Timothy Leary as a fraud. I went into this track with some trepidation, as I worried Thompson would be such a loose cannon that the commentary would turn into little more than incoherent ramblings. That does occasionally occur – Thompson’s given to random whoops and grunts, and his homophobic asides get old – but Nabulsi helps keep Thompson reasonably on track. Granted, it’s hard to know how much of Thompson’s remarks are fact and how many are fancy, but it’s definitely interesting to hear the man himself chat about the movie and his life, so this one deserves a listen. The other extras split into two categories: “The Film” and “The Source”. Within The Film, three Deleted Scenes fill a total of 10 minutes, 31 seconds. We get “The Mint 400” (1:22), “The DA from GA” (5:37), and “The Hardware Barn” (3:32). These are actually pretty interesting, as they deliver some amusement and intrigue. I don’t know if they would’ve worked in the final flick, but on their own, they’re enjoyable. We can view these with or without commentary from Gilliam. He tells us a little about their creation as well as why he omitted them. Though not the most fascinating notes, Gilliam delivers the necessary goods. Seven collections of Storyboards follow. These cover “Opening Sequence” (21 screens), “The Mint Hotel” (16), “Baker” (4), “The Flamingo Hotel/DA’s Convention” (12), “Adrenochrome” (7), “Duke Drives Gonzo to the Airport” (15), and “Final Sequence” (5). Don’t expect well-drawn boards, as these tend to be pretty crude, but they’re fun to see and offer a good glimpse of the planning process. Under the Stills Gallery, we get a collection of pictures taken by set photographer Peter Mountain. We find 95 of these shots from the set. These offer a good set of images. Under Depp-Thompson Correspondence, we get a 14-minute, seven-second piece. In this, Depp reads some of the letters that he and Thompson exchanged with each other over the span of the production. Unsurprisingly, these tend to be rambling and often nonsensical, but they’re still fun to hear, especially as Depp tries to deal with Thompson’s nuttiness. Behind the scenes footage shows up via Hunter Goes To Hollywood. It lasts 10 minutes, 39 seconds and follows Thompson as he comes to LA, hangs out at his hotel, and visits the set. Nothing especially brilliant appears, but it’s nice to get a look at the real Thompson as he interacts with elements of his recreated past. Given the film’s tortured path to the screen, it came with fits and starts. We follow some of these in the area called Not The Screenplay. First we find an “audio discussion of WGA dispute” that lasts 17 minutes, four seconds. In it, Gilliam and co-screenwriter Tony Grisoni chat together, while the piece edits in notes from Nablusi. These detail the development of the script and various controversies that led to issues with the screen credit. It’s a frank and compelling view of the topic. A short piece called “Dress Pattern” goes for one minute, eight seconds, and acts as Gilliam’s satirical response to the screenwriting controversy. It would’ve run before Fear and given Gilliam/Grisoni some screenwriting credit if the WGA denied their claim as discussed in “Not”. It’s a clever way to handle the situation. “The Film” finishes with A Study in Marketing. This area includes one traiiler as well as seven TV spots. We can watch the trailer with or without commentary from Gilliam, who bemoans the misguided tone taken by the ad. When we shift to The Source, we open with Oscar Zeta Acosta: Dr. Gonzo. In this area, three components arrive. A “Biographical Photo Essay” mixes nine picture elements and text to tell us more about Acosta, the inspiration for “Dr. Gonzo”. “The Revolt of the Cockroach People” is another photo essay, though not a still gallery; it runs 29 minutes, 44 seconds and presents foootage of Acosta as he reads from his semi-autobiographical book of that title. This is interesting to hear but not to see; not only is the footage monotonous, but the tubby Acosta chooses to wear a mesh T-shirt, so we’re stuck with the constant image of his flabby torso. Muscular guys shouldn’t wear outfits like that, much less obese ones. The “Gonzo” domain finishes with “Thompson on Acosta”. In this, Thompson reads his introduction to the 2002 reissues of Acosta’s books. It fills seven minutes, 31 seconds as Thompson relates his thoughts about his old comrade. Thompson functions best when structured like this, so his memories provide a compelling – and typically quirky – take on Acosta. The Ralph Steadman Art Gallery gives us a collection of stills. We find 44 screens of images that let us see the work of the Fear and Loathing illustrator. With a mix of printed material and unpublished elements, it becomes a nice compilation. More audio material shows up via Breakdown on Paradise Boulevard. This comes from a 1996 CD release of Fear and casts Jim Jarmusch as Duke, Maury Chaykin as Gonzo, and Harry Dean Stanton as the narrator. It goes for seven minutes, 43 seconds and adds an interesting little curiosity, especially since it focuses on a sequence that didn’t appear in the movie. We finish with Fear and Loathing on the Road to Hollywood. A 1978 BBC documentary, it runs 50 minutes, 20 seconds as it focuses on a road trip with Thompson and Steadman. It also throws in excerpts from Fear and Loathing as well as archival pieces and interviews with the two participants. Heck, it even tosses in a chat between Thompson and Watergate notable John Dean, and we see a rally with Bill Murray in attendance promoting “Nixon in ‘80”. The show includes plenty of interesting insights, though one should expect a lot more from Thompson than from Steadman; the author dominates the piece, probably because he’s a lot more flamboyant and eccentric. Though we get a lot of Thompson elsewhere, it’s nice to see the man more closely in his element as a younger man; while the older Thompson remained untamed, it’s still good to check him out only a few years after the events of Fear. “Road” becomes a good program that remains compelling after all these years. The set ends with a 28-page booklet. This provides an essay from film critic J. Hoberman as well as two pieces from Hunter S. Thompson. These help finish the package in a classy manner. Wild and unhinged like the novel that inspired it, Fear and Loathing in Las Vegas won’t be for everyone. Nonetheless, it offers an uninhibited take on its source and can be fascinating viewing. The Blu-ray provides mediocre audio but picture and supplements are very good. This becomes a fine release for an unusual movie.